Incident command (IC) often uses a whiteboard or pen-and-paper to plan tactical strategy, create assignments, and track resources at the scene of the incident. Today, many departments are turning to incident command software as a modern and efficient way to manage incidents and events of all types. Below, I’ll discuss the benefits of the electronic incident command board and why ICs around the world are moving away from pen and paper for command. When using a pen and paper or whiteboard, command generally creates a picture that looks a bit like this. This rudimentary and quickly-drawn diagram identifies each side of the structure, typically based on the address side of the building. This is then used to keep track of assignments, label egress points, and document fire location. The diagram is also used as a reference throughout the incident. Often, we will see this diagram cluttered with information and notes as the incident progresses. When using an electronic incident command board, IC can easily make the above diagrams, and even multiple separate tactical worksheets. In addition, they gain access to a variety of tools to make more clear and detailed images of what’s happening on scene. Command can mark boundaries, define zones of approach, identify objectives, notate hazards, and designate staging and rehab areas, all from the electronic incident command board. Often, incident management software will also integrate with a department’s records management system. 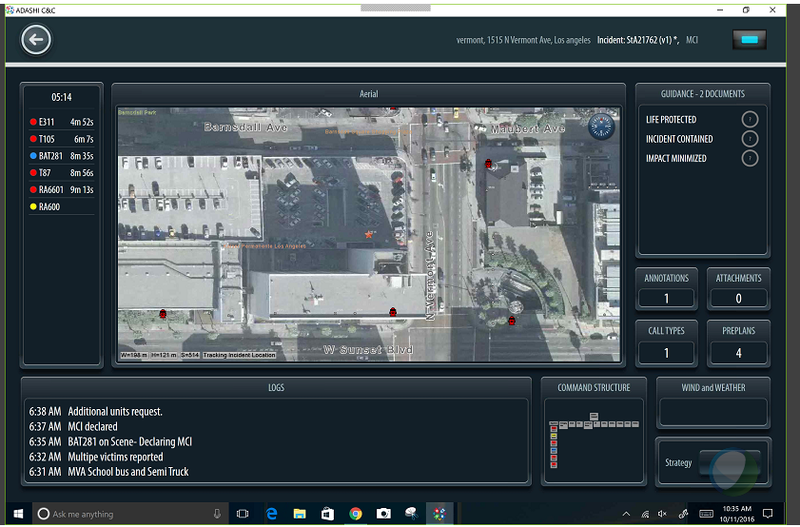 With this interface, command can create tactical worksheets from photos, incident pre-plans, city GIS provided information, and more. See the example below for reference. Command can note hydrants, exposures, egress points, hose lays, and other key data. Having access to this visual data at their fingertips helps IC plan apparatus placement and consider fire attack strategies. This leads to more informed decision-making as command can create a clearer picture of the incident they are managing. An electronic incident command board also lets IC drag-and-drop resources to staging areas or precise locations. For instance, when you give assignments via radio like: “Engine 18 you’re going to be third in, I need you to hook the FDC on the “C” side right by Car 11”, you can place your arriving apparatus onto the electronic white board, exactly where it needs to be positioned. This can be seen in the image above. Command can also access a flexible organizational hierarchy chart to assign resources to tasks. As an incident grows or changes in complexity, IC can expand the org chart to account for new roles or responsibilities, such as “Staging”. Adashi’s incident command product is based on the National Incident Management System (NIMS) protocols, but electronic command boards can easily be set up depending on a department’s SOPs\SOGs. Some electronic incident command boards, including Adashi’s software, can alert command if the span of control becomes too large. The ability to quickly and flexibly move resources during an incident helps command place units and apparatus exactly where they need be and easily track them. This leads to more efficient and effective management of an incident. Electronic incident command boards also create a common operating picture and improve interoperability among departments. This technology facilitates unified command, since multiple people using the system at an incident can view and create updates and changes in real time. If you have multiple tablets using linked electronic incident command boards at the scene, everyone with the product can see annotations and assignments. So, if your fire department is working with a police department on an active shooter scenario, all officers with the tablet have the same information, even if they’re in a staging area or on different radio channels. This communication helps create a coordinated response among different departments or jurisdictions. With a clear common operating picture, law enforcement and fire can more safely work together at a scene. Some departments will provide a tablet with an electronic command board to their safety officer and rapid intervention teams (RIT) to continuously monitor the scene. This way, if the safety officer notices any changes that affect life safety or attack strategies, he/she can input that info directly into the product. Using the digital system, the commander sees it immediately and the RIT can keep tabs on crew placement and possible egress points. I’ve outlined just a few of the benefits of using an electronic incident command board over traditional whiteboards. Many departments around the world are moving away from paper and towards incident command software. These systems improve tactical planning, interoperability, and situational awareness. As public safety technology continues to advance, I expect to see many agencies moving toward innovative digital emergency management systems. Interested in learning more about Adashi’s incident command product? Adashi is hosting a free, online webinar November 28th to demonstrate our command software. Register today to secure your spot or use this link to sign up for a free web demo with one of our product specialists. Bradley Reineke is the Adashi National Sales Director. He is a retired career firefighter and has numerous years of experience in public safety.